Gov. 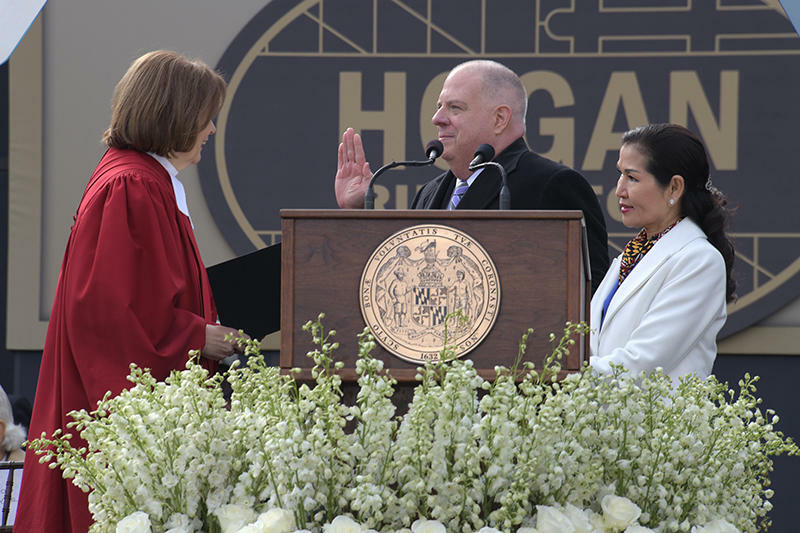 Larry Hogan takes the oath of office at his second inauguration on Wednesday. Speaking during Wednesday’s ceremony, former Montgomery County Executive Ike Leggett, a Democrat, attributed Hogan’s reelection — and his record number of votes — to his bipartisan governing habits. It was a point that was echoed repeatedly throughout the ceremony. Hogan touted policy achievements such as investments in education and infrastructure, a lower health insurance premiums, which were the result of the reinsurance fund the General Assembly created and Hogan approved last year. He promised to continue what he described as four years of reaching across party lines to strike bipartisan compromises. “I come from the get-to-work and get-things-done school of politics, and I’ll work with anyone who wants to do the people’s business,” he said. Hogan said he looks to Bush’s father, President George H.W. Bush, as a role model, as well as to the late Arizona Senator John McCain. But he said he especially admires the legacy of his own father, Congressman Larry Hogan, Sr., the first Republican on the House Judiciary Committee to vote to impeach President Richard Nixon. “’Party loyalty,’ he said, ‘and personal affection and precedents of the past must fall before the arbiter of men’s actions: the law itself. No man, not even the President of the United States, is above the law,’” Hogan recalled. But more than politics, the day was about observing traditions and celebrating, complete with a 19-gun salute and a flyover by four A-10 planes. Between the speeches, there were also musical performances. The U.S. Naval Academy Glee Club performed the Star Spangled Banner, and Sergeant First Class Erin Betz performed America the Beautiful with the Maryland Army National Guard.